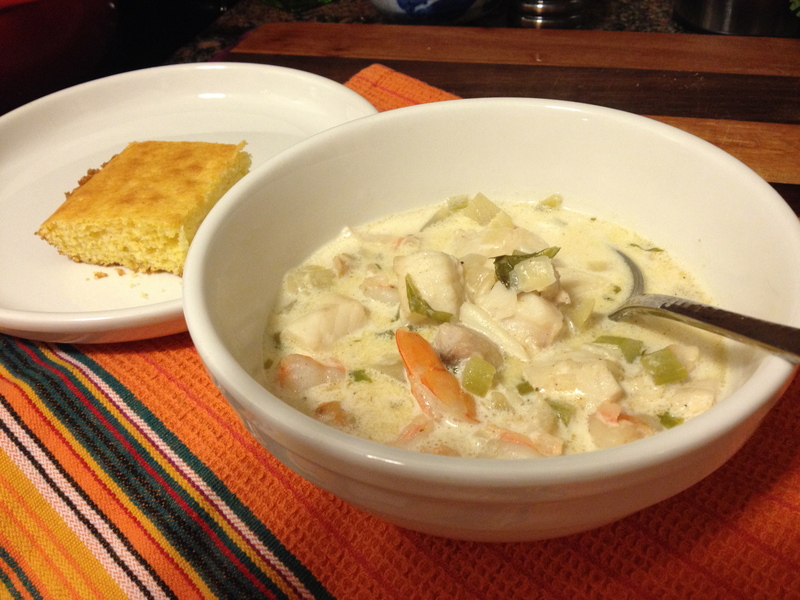 This time it’s a spicy seafood chowder with cod and shrimp, a recipe from Rachael Ray. It’s got a great kick from the Old Bay and cayenne, and it’s not too thick. Poaching the fish and shrimp in the liquid makes it so nice and tender, it melts in your mouth. And you get some good heartiness from the potatoes. Even reheated it’s fantastic! I could eat this every day. It was also surprisingly easy to make, besides the fact that I mistakenly got non-EZ peel shrimp at the fish counter and had to devein and shell them, which made me not super happy. (Shelling is easy as long as they are deveined.) Oh well, they were yummy. This recipe calls for “corn toasties” which I remember from my childhood but they weren’t that amazing, so I made corn bread instead. Any white fish will work in this — tilapia, cod, scrod, etc. Don’t obsess about the size of the shrimp, since you cut them up anyway. This makes a lot of soup. I started worrying after I finished since this wouldn’t freeze well, and ended up delivering a Tupperware-full to my BFF since there was no way I was eating it all on my own before it would go bad. I would estimate it was about 12 servings. When reheating, I highly recommend either gently heating it in a pot on the stove or microwaving it on 50%, since heating it too fast may cause the fish to get tough. Heat a medium soup pot over medium-high heat. Add the EVOO and the 2 tablespoons of cold butter, cut into small pieces. Add the veggies, then season them with the bay leaf, salt, pepper, and Old Bay Seasoning. Cook for 5 minutes to begin to soften, then add the flour and cook for a minute longer. Next, add the sherry and cook for 1 minute. Whisk in the stock and bring it up to a bubble, then arrange the seafood in an even layer around the pan. Cover the pan and cook until the fish is opaque and the shrimp is pink, 4 minutes. Remove the lid and add the milk and cook for 2 to 3 minutes longer to thicken. Add about 1/4 teaspoon cayenne pepper, then adjust the seasonings. Discard the bay leaf. Melt the remaining 2 tablespoons of butter and 1/4 teaspoon of cayenne pepper in a small cup. Toast the corn pastries, brush with cayenne butter, and sprinkle with the chopped chives. 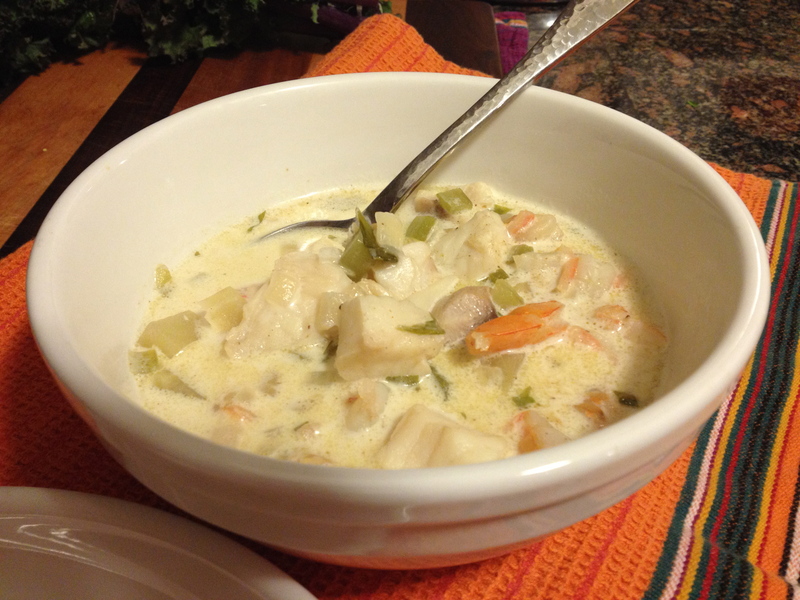 This entry was posted in Recipes, Uncategorized and tagged chowder, fish, Rachael Ray, seafood chowder, seafood newberg stoup, shrimp by Tricia. Bookmark the permalink.